We’d love your help. Let us know what’s wrong with this preview of Witchfinder by Sarah A. Hoyt. To ask other readers questions about Witchfinder, please sign up. Very nice twist on regency novels, dimensional hopping & Fairyland. I really enjoyed this book. The plot was clever, the characters people you could like and admire, and the world vivid and alarming. Seraphim was the kind of man you don't see a lot of in fiction these days, it seems, a real hero. He's driven by duty and the need to do the right thing, and he's very easy to empathize with. More, please. I'm a long-time fan of Georgette Heyer, so I particularly enjoyed a minor character, the dandified but efficient Mr. Blythe, who I took to be a most excellent homa I really enjoyed this book. The plot was clever, the characters people you could like and admire, and the world vivid and alarming. Seraphim was the kind of man you don't see a lot of in fiction these days, it seems, a real hero. He's driven by duty and the need to do the right thing, and he's very easy to empathize with. More, please. I'm a long-time fan of Georgette Heyer, so I particularly enjoyed a minor character, the dandified but efficient Mr. Blythe, who I took to be a most excellent homage to Heyer. More of him, too, please. I hope. This is the most convoluted book I have read in a long time. Imagine every fairytale fantasy plot and character you can think of. Then throw it all into a poor defenseless book, add Arthur, Merlin, dragons, fey, a multiverse, a duke, spunky females and then give it a good stir... and hope for the best. The best in this case is 2 stars because I finished it. Skip this one, you'll be glad you did. I bought this book because the author was going to be at a convention I attend. Loved it! The magical world is excellent as are the characters. Did Not Finish, got a little more than half way but it was just a bit too Harlequin-y for my tastes. A fan of Sarah Hoyt, I was eager to read this book, thinking from the title that it would be a tale of a magician troubled by the fate into which he was born, that he would have to track down and incarcerate witches, wizards, sorcerers, sorceresses and other sages. And though the book was much different from what I expected it to be, I enjoyed reading it, finding it the perfect pastime to amuse myself as I did my daily dose of cardio. Having it on a kindle makes for most easy reading. But, this he A fan of Sarah Hoyt, I was eager to read this book, thinking from the title that it would be a tale of a magician troubled by the fate into which he was born, that he would have to track down and incarcerate witches, wizards, sorcerers, sorceresses and other sages. And though the book was much different from what I expected it to be, I enjoyed reading it, finding it the perfect pastime to amuse myself as I did my daily dose of cardio. But, this hero, Seraphim Ainsling, the eponymous witchfinder, wasn't seeking evil enchanters in order to protect them from doing harm, but seeking out outsiders with magical abilities who, without his work might find themselves prey to others who might ostracize or incarcerate them for their gifts. Or worse. The characters, including the hero's half-brother, a woman not entirely certain of the work she is doing or of her own background, move around in a number of worlds, including our own and a Fairyland. And perhaps it's her description of fairyland (note the lower case here) that really makes this book stand out. 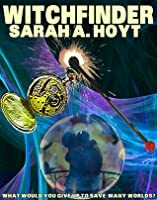 Just as the filmmakers who crafted the mystical fairy realm in Snow White and the Huntress, Hoyt has her own unique spin on this world and in describing it shows how storytellers across generations have used that realm to offer insight into her notion of magic. Here it is described as a "parasite" world, perhaps in need of a new ruler to change its place in the multiverse. But, all worlds, not just Fairyland itself, are dependent on its survival. That may well be her way of saying all worlds need a little magic. And this book has more than a little magic. It's just a fun read. If you're looking for something to delight your mind as you strive to stay in shape, this is a perfect book to download to your kindle to read while you work out. Witchfinder is one of those rare stories that is at once comfortably familiar and relentlessly surprising. It starts out with all the trappings we expect as fantasy fans: richly imagined worlds, magic, larger than life heroes and villains, and, of course, fantastic creatures big and small. However, magic and world-building, exciting as they are, take a back seat to the characters. And oh boy, are there characters. If this book was a TV show, I would be spending all my time dreaming up spinoffs b Witchfinder is one of those rare stories that is at once comfortably familiar and relentlessly surprising. It starts out with all the trappings we expect as fantasy fans: richly imagined worlds, magic, larger than life heroes and villains, and, of course, fantastic creatures big and small. However, magic and world-building, exciting as they are, take a back seat to the characters. And oh boy, are there characters. If this book was a TV show, I would be spending all my time dreaming up spinoffs based around each and every one of them. Even the obligatory archetypes -the intrepid hero, the seemingly innocent fish-out-of-water, the perpetually fretting mother, the sidekick- are full of surprises and endless layers that are all interesting and important to the story. By the time the reader meets the rest of the cast, it's impossible to stop reading because you just want to KNOW, not just the turns of the plot, but the fate of everyone involved. That's not to say the story is in any way lacking in action. In fact, action is more or less non-stop, with exposition stuffed in little crevices around the chases, fights, spells, magical journeys and various fantastical perils. There are some interesting themes as well: duty and sacrifice vs. personal fulfillment, fate vs. choice, adventure vs. safety, and, above all, love in all its varied, messy forms. This work would actually make for a great book club discussion because there are so many points that people of varying ages and life experiences would perceive in different ways. So in one of my favorite movies, there's this scene. It involves an older chef stepping in to fix a mess, and as he's tossing things together, someone runs up and frantically asks "But what do we call it?" and he says, "A Belle Melange, a beautiful mess." For some reason as I was reading this book, that came to mind. It's not that the book is a mess, far from it. It's tightly plotted, the action is almost continuous, with enough let-down and talk moments to give you a breath, even if the characte So in one of my favorite movies, there's this scene. It involves an older chef stepping in to fix a mess, and as he's tossing things together, someone runs up and frantically asks "But what do we call it?" and he says, "A Belle Melange, a beautiful mess." For some reason as I was reading this book, that came to mind. It's not that the book is a mess, far from it. It's tightly plotted, the action is almost continuous, with enough let-down and talk moments to give you a breath, even if the characters never get a break. No, this book is a beautiful mixture. Regency romance, fantasy, modern Earth, dragons, dryads, fairyland, the nature of magic… it's all in here. Assassination plots, kidnapping, more kidnapping, and in the middle of it, a prosaic Earthwoman. It shouldn't work… but it does. I can't tell you how many times I have picked up a time-travel romance book over the years, to put it back down in disgust as my suspension of disbelief was mauled beyond endurance. I eventually stopped reading them. Sarah Hoyt touches on this in Witchfinder, with accuracy and humor, and her solutions are pragmatic without losing the charming romance. The ending was perfect. The weaving of the worlds, the explanation of magic, where it came from, and why some worlds lack it, that alone is worth reading this for. You will rarely find such a well-developed system for magic, nor one so believable. Magic has consequences, and a price, and not only to an individual, but to a society. I admit I was a bit hesitant. Sarah writes great SF, but my experience with SF writers who cross over to fantasy hasn't been great. I shouldn't have worried. The plot is complex but not convoluted, the action starts from the first (ok, the second) page, the main characters are interesting and three-dimensional, and the plot twists are, well, twisty. (The one twist I spotted early on gets resolved about halfway through the book. It was like Sarah was saying, "Yeah, this one's so simple, I won't l I admit I was a bit hesitant. Sarah writes great SF, but my experience with SF writers who cross over to fantasy hasn't been great. I shouldn't have worried. The plot is complex but not convoluted, the action starts from the first (ok, the second) page, the main characters are interesting and three-dimensional, and the plot twists are, well, twisty. (The one twist I spotted early on gets resolved about halfway through the book. It was like Sarah was saying, "Yeah, this one's so simple, I won't leave you hanging.") Not every writer understands the reader this well. There's light romance in varying favors, but no steamy scenes, thanks very much. Very basically, the book is an interesting take on the "many parallel worlds with differing levels of magic" idea. A young woman from our Earth gets pulled to an alternate of much higher magic, the British empire is the dominant political entity, magicians abound, fae and other magical creatures hatch plots, aristocrats have varying degrees of ethics, and the good guys and bad guys have tea like civilized people. Nicely, Sarah didn't get into overmuch detail on the world building; we get a feel for the complexity of the universe without being dragged through endless details, with a hint of steampunk. I'm very much hoping this is the beginning of a series. My patience for all things Regency begins and ends with persons actually writing from that period and Georgette Heyer. Despite that, and a rather tedious introductory chapter, Witchfinder caught fire at the start of the second with a premise and character that grabbed my attention and didn't let up until the thrilling finale. Yes, the book was cheese. But it was fun, entertaining cheese. I doubt I'll re-read it, but I found this volume superior to the other likable outings by the same author, wi My patience for all things Regency begins and ends with persons actually writing from that period and Georgette Heyer. Despite that, and a rather tedious introductory chapter, Witchfinder caught fire at the start of the second with a premise and character that grabbed my attention and didn't let up until the thrilling finale. Yes, the book was cheese. But it was fun, entertaining cheese. I doubt I'll re-read it, but I found this volume superior to the other likable outings by the same author, with improved world building and adventure. Hoyt has a slight tendency to create the dimensionless villain but that villain served this particular story well. This is the first book of hers that I have read. Seen lots of mentions, but was a little skeptical concerning her large number of titles and some rather cheesy cover art. Skeptical no more.With the first chapters of this book I expected a rather well-defined story and if the plot had followed what I imagined I wold have been happy with this story playground. Yet what actually happened was more of a plot explosion where the story kept getting larger and paradoxically smaller as it drew in the main This is the first book of hers that I have read. Seen lots of mentions, but was a little skeptical concerning her large number of titles and some rather cheesy cover art. Skeptical no more.With the first chapters of this book I expected a rather well-defined story and if the plot had followed what I imagined I wold have been happy with this story playground. Yet what actually happened was more of a plot explosion where the story kept getting larger and paradoxically smaller as it drew in the main characters and their intertwinings. So there was a lot of fun with the reveals and the nature of fairyland. I've been meaning to read one of her books for a while now and think I picked a great one to start with. Not your typical magic novel, not your typical modern-day twist on witches. Sarah blends the best of both worlds and brings you characters you root for, because you've never quite seen anything like them. No cliches or "I've read that a hundred times" scenarios that you have you reaching for the next read. Fans of "Once Upon a Time" will see how she blends beloved genres all while adding her o I've been meaning to read one of her books for a while now and think I picked a great one to start with. Not your typical magic novel, not your typical modern-day twist on witches. Sarah blends the best of both worlds and brings you characters you root for, because you've never quite seen anything like them. No cliches or "I've read that a hundred times" scenarios that you have you reaching for the next read. Fans of "Once Upon a Time" will see how she blends beloved genres all while adding her own particular 'stank' (which is good) to them. My one complaint: the cover makes it seem like a cheesy romance set in the Victorian error/era. Not original but cute and well executed. Lots of lighter moments and the family ties were what this story really hung on. If ou like many-worlds fairy tales or regency romance you'll enjoy this fun adventure about a fairly normal young woman from earth and a lovely family of magicians from avalon. Quite enjoyable fantasy adventure with light romance thrown in that perhaps got a bit too complicated. Since I do like regencies as well, the fantasy world that resembles regency era was a bonus for me. American readers probably resent the fact that this fantasy version of England kept hold of their colonies. :) Too many POVs for my liking, but that's just me. Hmm. Is this four stars on a Name of the Wind scale? Probably not. 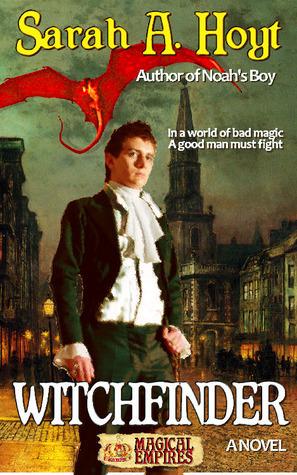 But it's a fun page turner and guilty pleasure, mixing a Lord Darcy-like magical society with a multiverse crossover from our Earth. With a bit of Three Musketeers thrown in for good measure. Starts like such an innocent romp and quickly becomes a complex set of interlocking arcs. Wonderful characters, strange worlds and a fresh take on multiple worlds. Loved it. More please. characters Include humans, fairies, dragons and royalty and parallel worlds. The story is fun to read. The characters had flaws that made them Interesting. It is suitable for any age, but not written in a childish manner. Another reason to look forward to Friday! Weekly installment is fun and light reading. Can't wait to see how this comes together. Thanks Mrs. Hoyt! Very entertaining. Certainly needed some serious proofreading,though.